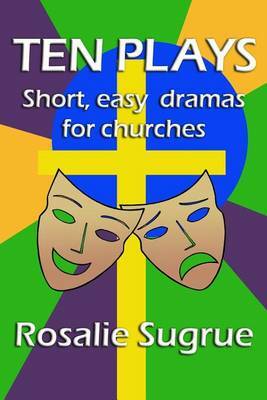 "Lay preacher Rosalie Sugrue's short plays and meditations are ideal to present in church. They encourage us to engage with Bible and historical characters, and explore important themes. Staging is simple. Few props or costumes are required. Unless marked [adults] these play read... read full description below. Praise for Ten Plays: This collection of dramas by Rosalie Sugrue will be welcomed by church leaders. At a time when the church is struggling to fully engage people, she has provided us an extra resource for those special seasons and occasions that will add interest to worship services as well as to other church events. The relevant themes and easy scripts have the ability to involve people of all ages and stages. Rosalie's ready-made dramas have already had wide acceptance for their appropriateness to the New Zealand context and their ability to be easily capture the imagination of those in our congregations. Andrew Gamman - Refresh Ministry Methodist Mission Resourcing Lay preacher Rosalie Sugrue's short plays and meditations are ideal to present in church. They encourage us to engage with Bible and historical characters, and explore important themes. Staging is simple. Few props or costumes are required. Unless marked [adults] these play readings are suitable for children to present. Most work best with a combination of children and adults. Summary of the Plays - Mary Jones' Walk - for a family service or Bible Sunday in July. Relive the story of the 15-year-old Welsh girl who walked 25 miles in search of a Bible and by doing so helped inspire the founding of Bible Society. - When The Treaty came to Mangungu - for a Waitangi Day celebration in early February. An historic event told from the perspective of Rev John Hobbs' 11-year-old daughter Emma. -Easter Women [adults] - for Lent, March/April. Listen in on five women who may have shared a room on that Saturday night so long ago: Mary of Nazareth - the mother of Jesus, Mary Magdalene alias Mary of Bethany, the 'other' Mary, Joanna and Salome. - ANZAC Day - for the Sunday closest to 25 April. Two children learn more about their family connection with World War One. Suitable for presenting in church when reflecting on war. - The Wesley Saga - for any Wesley Celebration or Wesley Day, May. A rhyming romp through the family history of Samuel and Susanna Wesley, sons John and Charles and their sisters. - A Peace Presentation [adults] - any time, or Peace Sunday, early August. Monologues of two women from the scrolls of Hebrew Scriptures and two from the pages of New Zealand history. Ordinary women who by wit and will were each peace achievers. - Mahlah & Sisters - a justice issue Bible story for any time of year. Five capable daughters successfully lobby for women to be able to own land. - Christmas Women [adults] - multiple uses during Advent. Five meditations of women sharing their encounters with Mary for use in advent worship: Elizabeth (Mary's cousin) talks with Anna; Anne (Mary's mother); Woman Traveller; Inn-keeper's Wife; Anna (the prophetess). - No Room - for Advent, Christmas & Christian World Service celebrations. Makes a thought-provoking link between refugees arriving by boat at Christmas Island and Mary & Joseph finding no room at the inn. - A Christmas Story - for Advent and Christmas. 13 stick puppets. Theme: God is with us. About the Author: Rosalie May Sugrue is a wife, mother and grandmother. She is a retired teacher and motellier with a background in Bible study. Rosalie is a past National Programme Convenor of the NZ Methodist Women's Fellowship; a past Vice President of NZMWF, is currently Wellington District Convenor of MWF and co-facilitator of Kapiti's Afternoon Fellowship; a past President of the NZ Lay Preachers Association; the inaugural Facilitator of the NZ Methodist Lay Preachers Network, a past member of the Churches Agency on Social Issues; and a past member of the Community of Women and Men in Church and Society. Retired to the Kapiti Coast Rosalie has been active in MWF, National Council of Women, Victim Support and U3A. She has plays, poems, prayers, Bible puzzles and articles published in many church magazines in NZ. She also has work included in devotional anthologies in Canada, the UK and the US. Rosalie May Sugrue is a wife, mother and grandmother. She is a retired teacher and motellier with a background in Bible study. Rosalie is a past National Programme Convenor of the NZ Methodist Women's Fellowship; a past Vice President of NZMWF, is currently Wellington District Convenor of MWF and co-facilitator of Kapiti's Afternoon Fellowship; a past President of the NZ Lay Preachers Association; the inaugural Facilitator of the NZ Methodist Lay Preachers Network, a past member of the Churches Agency on Social Issues; and a past member of the Community of Women and Men in Church and Society. Retired to the Kapiti Coast Rosalie has been active in MWF, National Council of Women, Victim Support and U3A. She has plays, poems, prayers, Bible puzzles and articles published in many church magazines in NZ including a regular Bible Challenge puzzle in Touchstone. She also has work included in devotional anthologies in Canada, the UK and the US. Recently, Rosalie co-authored a novel with her son Troy. Her latest writing venture Sophia & Daughters is a book of meditations and prayers centred round the extended stories of 29 wise women in the Bible.